The vast majority of stacked dado sets come in either an 6″ and 8″ version. “Now why wouldn’t I just get the larger set?” I hear you say. Well it comes down to a question of power (and a little bit about price). The heavier the stacked dado set is the more power is required to spin it. Many smaller portable, bench top and contractor table saws do not have the power in their motors to spin a heavy 8″ dado stack at a safe speed. 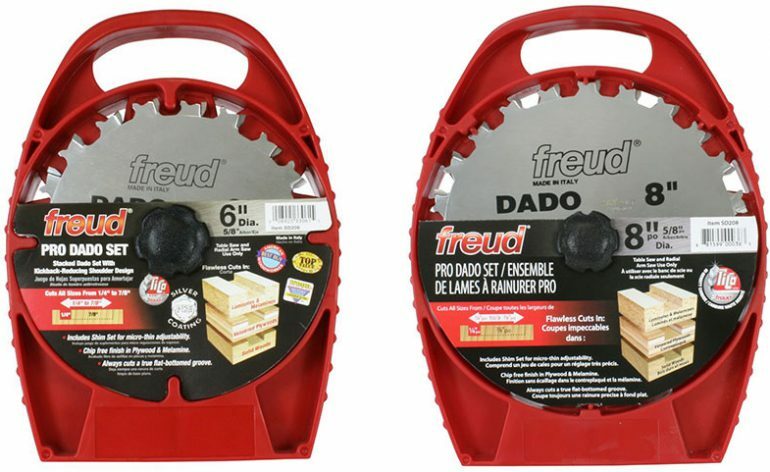 Freud tools is one of the manufactures that has addressed this problem by making their stacked dado sets in various sizes all the way down to 6″, meaning many more woodworkers will be able to use a stacked Dado set with their table saw. Today I wanted to look at the Freud SD206 and SD208 Professional Dado Set. Which could be described as their entry level stacked dado set, but it is anything but. At a glance it is a very good stacked dado set capable of cutting very clean, accurate dadoes in most materials for a price well under $100. The first thing to notice about these stacked dado sets is the weight. the 6″ version comes in at a very respectable 4lb and the 8″ comes in at 5.9lb. 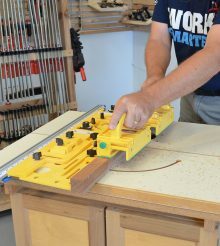 If you are not going to be cutting the maximum width of 7/8″ dado’s then the weight will be lower. I believe the SD206 is the lightest stacked dado set available. making it the sensible choice for portable/contractor style table saws where the motors aren’t as powerful as their cabinet and hybrid table saw cousins. The stacked dado set comes with 2 outer blades with 10 and 12 teeth respectively and a set of 6 chippers. three 1/8″ and three 1/16″ so you can cut dadoes from 1/4″ to 7/8″ in 1/16″ increments using the chippers alone. 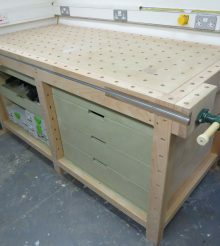 For very fine adjustment of the dado width you can use the supplied set of shims for a more precise cut. The chippers are the 2 wing style, which are very common on all but the high end stacked dado sets. and by doing this keeps the weight of the overall stack down. Full circular chippers are better for stability and will reduce vibration but the added weight is only viable on bigger more powerful stacked dado sets..
You may see blade hook mentioned a lot when you are looking at different table saw blades and stacked dado sets. Blade hook is the angle of the tooth. If you look at the tooth of a table saw blade at the 12 o’clock position does tilt forward or lean back? if it is tilting forward then this is positive hook if it is leaning backwards, then this is called negative hook. 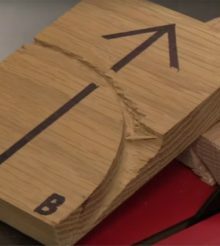 A negative blade hook means the saw blade will cut a lot less aggressively, meaning the work piece should be fed across the table saw slower but should leave a much cleaner dado. Positive hook will cut much more aggressively removing more material with each pass and leaving a slightly rougher finish. A positive hook can also slightly reduce the risk of kick back. With the tooth angled forward the blade when it is contact with the work piece is cutting down, pulling the work piece toward the table reducing the risk of the work piece lifting. the -12 degree negative hook on this blade means that you will get very clean and square dadoes. The blades and chippers have micro grain carbide tips, they hold a keen edge and are able to withstand being sharpened many times. The Freud SD206 and SD208 really are perfect for cutting great dadoes in a wide range and materials. If you find yourself using hardwoods, softwoods, laminates, chipboard and plywood and you want a dado set that will cut good quality dadoes in all of these materials, then this really is an excellent choice of blade. And being one of the cheapest stacked dado sets around there is a reason this is one of the most popular dado sets available. Nice video, thank you ! I am a new woodworker and am learning about every tool and it’s setup. This video on dado set up is extremely helpful. I will now make a point to watch as many of this guy’s videos as possible. Great explanations – Great teaching video! Thank you. That’s great Fran, Enjoy your woodworking! !